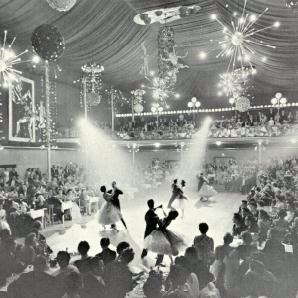 One of today's most popular ballroom dances, the Quickstep, made its entry into social dancing in the 1920s. Up until then the two predominant dances in the 20s were the Foxtrot and the recently introduced Charleston. The Charleston, because of its frenetic style, was doomed to be short lived. But, as bands began to play the Foxtrot at a faster pace dancers quickened the steps and added the Charleston. They began to call the dance the Quick Time Foxtrot and Charleston. In 1927, the English couple Frank Ford and Molly Spain, danced a version of the QTF&C at the Star Championships ( then the World Championships ) without the characteristic Charleston knee action, which became the new version of the dance accepted into ballroom dancing. Eventually the dance developed and a slower version became the "slow foxtrot" whilst the quicker version, still with some characteristics of the Charleston, became what we now know as the ballroom Quickstep. Professional dancers Miko and Alessia. Notice, despite the speed, the smooth movement interspersed with the stocatto of the Charleston.